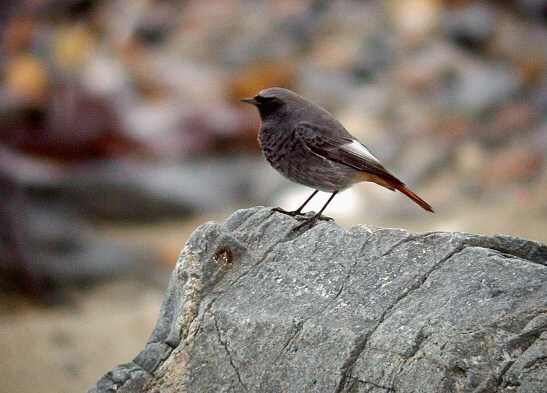 birds : On Tuesday after work, I called in at Pulias as Tony had seen an unusually large group of Black Redstarts on the beach there. I counted 8 birds which is double my previous largest flock size. And they were actually behaving as a proper flock, sallying for insects from the boulders above the beach - quite nice to watch, especially since one bird was a superb male, with a jet black face and striking white wing patch. It was so nice, I popped there again the next day with my camera and managed a reasonable shot in the poor light - one of my favourite species of bird. I received the latest issue of Birding World today and was really pleased to see my photo of the Lesser Scaup as a half-page picture. nonsense : I was very surprised to take a phone call last night from someone from Channel Television to ask if I'd like to be interviewed about the Copenhagen Summit and how climate change will effect the wildlife of Guernsey - (Jamie had very decently suggested me to them since I had authored a paper on the subject in the recent 'Planet Guernsey' book). The young lady was audibly shocked when I said "I don't really fancy being on the tele' thanks". She said to Jamie - (who did a typically super job of the interview in the end) - that I was "possibly the most reluctant interviewee ever! ", which tickled me somewhat! I suppose in this fame-hungry world we live in, people usually fall over themselves to get aminute in the spotlight and so people rarely turn her down. I decided a while ago that I would avoid at all costs any appearance on the TV, Radio or Newspapers - I have no interest in the media and I mostly look down on journalists as superfluous, self-important, unscientific, self-serving and irresponsible. I'm sure that's not true at all on a personal level, but that is the impression I get when reading/watching/listening the content that they produce. It may stem from way back in 1996 when I went to twitch a White-billed Diver on the River Witham in Lincolnshire. The bird had been around a few days and it was quiet and I rather reluctantly agreed to an interview for a Calendar TV News reporter. I told him about where the bird had come from, how rare it was in the UK, how unusual it was to get one inland, etc. When I saw myself on TV that evening, I saw that my expert analysis had been cut to two seconds of me saying "it's a good one for the list! ", like a no-good bloney tick-merchant! 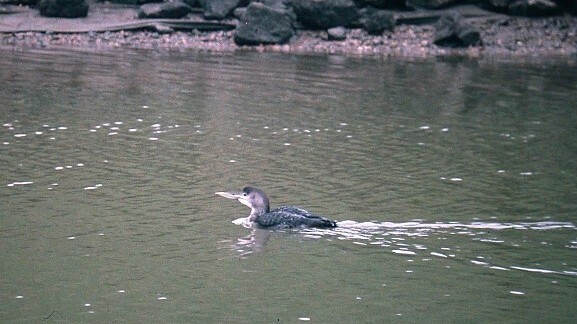 my photo of the White-billed Diver in Lincolnshire in 1996 - "a good one for the . . . . for the list!"